July 20th, 1969 marked the day man first set foot on the moon, as Neil Armstrong and Buzz Aldrin gracefully stepped out of their lunar lander and made history. 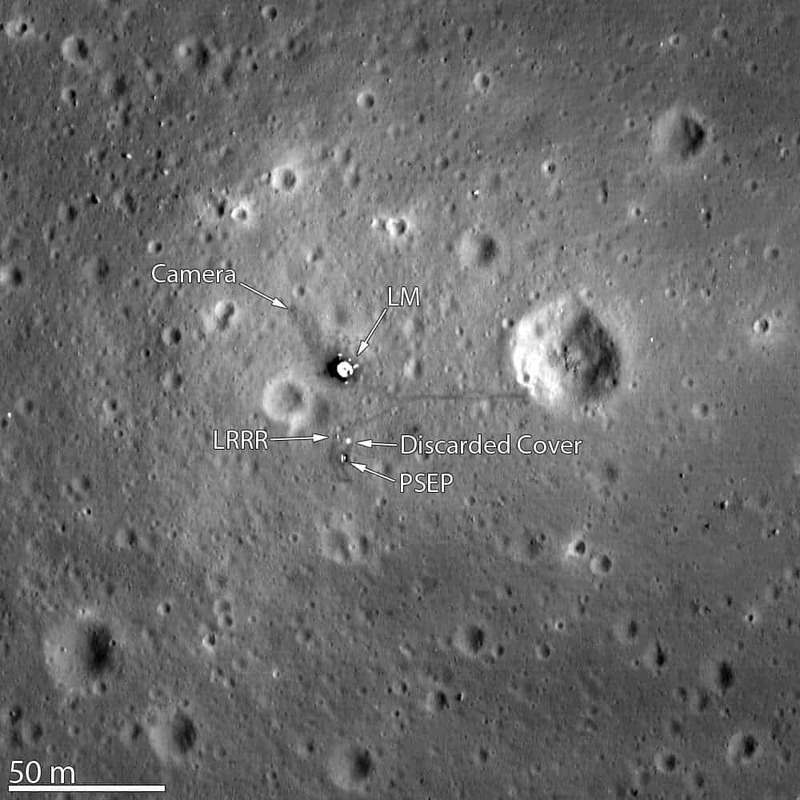 A recent photo snapped by NASA‘s Lunar Reconnaissance Orbiter has captured the most detailed view of the monumental landing site – it even shows remnants of Neil Armstrong and Buzz Aldrin’s first foot steps on the moon. The photo is extremely clear, revealing some impressive details, still in place and kept prestine by the moon’s environment to this very day. For instance, one can easily see things such as the camera the astronauts placed upon landing, a discarded cover from the Laser Ranging RetroReflector or, amazingly, the astronauts’ footprints – the dark regions around the Lunar Module that lead to and from various scientific experiments that were set up on the surface of the moon. This is the most detailed image of the lunar landing site captured thus far. The photo was shot from 15 miles away, revealing an area about the size of a typical city block, showing just how restricted the Apollo 11 astronauts were. Future manned missions to the moon allowed astronauts to explore much more freely, and Apollo 15, 16 and 17 missions were actually equipped with a Lunar Roving Vehicle, which greatly increased their autonomy. The Lunar Reconnaissance Orbiter, no larger than a car and worth $504 million, has been circling the moon since its launch in June 2009. This particular photo was released March 7 by NASA.